- The best player that I saw this week was Rasmus Ristolainen. He defended well, moved the puck efficiently and showed all-around polish and confidence in his two-way game. He dropped the baby fat while adding strength to his big frame, setting him up for that top four NHL projection that we keep talking about. It's gotten harder and harder to imagine him in Rochester this fall. - Mikhail Grigorenko looks like a different player. He dominated the three-on-three tournament with his size and hands, and is showing more of a battler's mindset on the cycle and when using his stick defensively. He continues to make a pronounced effort to have more explosive starts and crisper stops, and his overall skating stride showed improvement from where it was a year ago. He still has work to do towards hitting his high-end potential, but I appreciated the progress and the willingness to be accountable for his past performance, and I liked how he actually picked up his tempo late in Friday's tournament while others were slowing down. - Linus Ullmark and Nathan Lieuwen rose above their goaltending peers this week. Both are big boys who show the requisite athleticism to have NHL success down the road. I thought Lieuwen was terrific in the three-on-threes in a situation where vision and goalie IQ are needed to be sharp. Ullmark simply has all the tools you want in a young goalie. He's aggressive and competitive. With added quickness and crisper move-to-move sequences, it'll be game on for the talented Swede. - Say hello to a full-time NHL job, Mark Pysyk. Development Camp is not training camp. No jobs are won in July, but everything he has done to date should see him win a top-six role this fall. - The future of the middle lines is in very good hands with the "pro styles" of Hudson Fasching, William Carrier, Nick Baptiste, and Brendan Lemieux. All of these guys are strong, move very well and battle hard on their way to the net, and all of them can fire the puck with authority. We know that Fasching, Carrier and Lemieux have power forward tendencies, but I continue to be impressed with Baptiste's versatile mix of speed and grit. 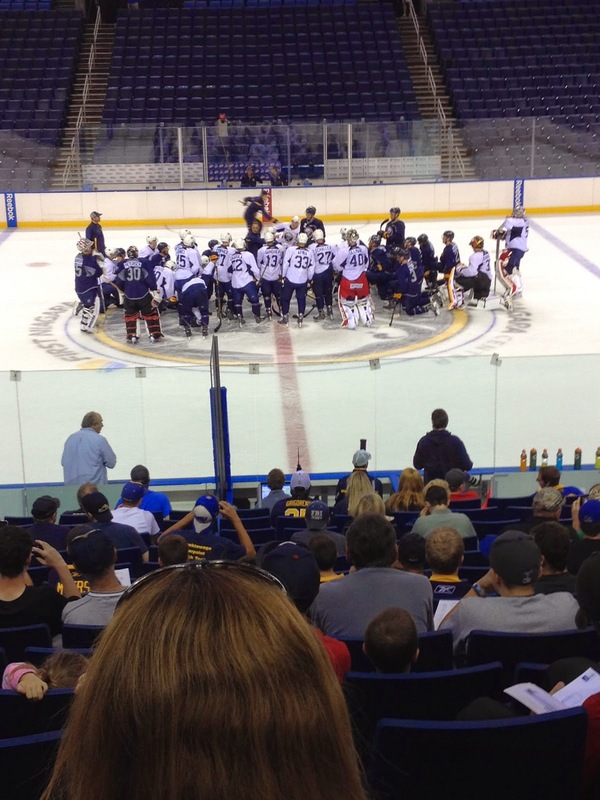 - Aside from stirring things up with guys like Girgensons, Ristolainen and J.T. Compher, Lemieux was at his best when digging in down the middle of the ice. There isn't much finesse there, but rather a guy who's willing to put his shoulder down and overpower defenders. But again, if he's drawing attention from the best players in a practice environment, think about what he's going to do against the Bruins, Habs and Leafs when he finally puts on an NHL jersey. Teams are going to regret not taking him, and I still can't believe Lou Lamoriello opted for John Quenneville over him, but who am I to evaluate a Cup winning GM. - It's often not too difficult to get behind a late-round pick, but it looks like Victor Olofsson is going to be the biggest sleeper in the prospect ranks. Good changes of speed with the puck and an ability to quickly elevate it from in tight. He worked hard this week. The Sabres can sit on him for a few years, but long term sniper potential is plain and clear with this kid. - Drake Caggiula, a camp invitee out of the University of North Dakota, proved himself to be an instinctive worker who can produce goals. He's not the biggest guy, but he consistently placed himself in the right position to make plays. He roofed several goals short side in Friday's three-on-three tourney as Team Grey cruised through undefeated. I thought he was far and away the best FA invite. - Eric Cornel makes really good decisions when given space to operate. He's got a nice, quick shot and there weren't too many plays where I wish he had done something else with the puck. I walked away impressed with where he sits with two more years of junior ahead of him to get stronger up top. - On the flip side, Joel Armia's body language at times showed disinterest. The crazy talent is there, and he certainly showed flashes in the scrimmage, but I still wonder about his desire every time he steps out to play. Too many blind passes for my liking, and still trying a lot of one-of-one stuff. I'm not judging a player's long-term future off a handful of summer practice sessions, but he does need to keep the switch flipped "on". I hope his head is in the game come fall. - Max Willman looked like an interesting long-range prospect this week with good eyes in the offensive zone and very soft passing hands. I didn't see many dazzling goals come off his stick, but he plays an honest two-way style that offers lots of promise down the road once he puts a few years in at Brown. - Justin Bailey showed spurts of his power game in the three-on-threes. One play saw him kick it into a higher gear on a cut to the front of the net, only to be robbed by a sprawling Jonas Johansson. Another play saw him sling a laser beam into the top of the net from the faceoff circle. He needs to realize how strong he is and start using his gifts with regularity this season to earn a pro contract. - There is a still training camp ahead to truly battle, but as of now I'm sending Nikita Zadorov back to the OHL. - Andrey Makarov will play second fiddle to Lieuwen in Rochester this year, but did his thing with a flashy glove hand and better side-to-side movement. He always makes showstopping saves, but needs to limit some of the soft goals. - I loved the scrap between Anthony Florentino and Justin Kea at Tuesday's scrimmage. Florentino lit Kea up with a big open ice hit in the first period, and Kea got his number and dialed it in the second period. Great to see that passion in July. - If the three-on-threes were all about seeing who was ready to battle and produce in down-low traffic, guys like Kea and Sean Malone likely impressed the coaches. Kea has always been tough in the trenches, but Malone looked the part of a hungry, smart player in helping Team Gold reach the tournament final before falling short against Gray. - Entering the week, I was thinking that Tim Schaller between Jordan Samuels-Thomas and another power winger could make for one dandy line in Rochester this fall. With that in mind, I was pleased to see them together on Team Team for the three-on-threes. Both players are cut from the same cloth in that they'll skate hard, work for their chances and use their size to make simple plays. - Two of the quieter, yet solid performances of the week were put in by defensemen Brycen Martin and Brady Austin. Martin was simple and safe in five-on-five, and showed some nice finishing skills when given room to play with in the three-on-threes. Aside from one turnover at the side of his net on Tuesday, Austin mirrored Martin's simplicity and overall effectiveness while showing some good passing skills in the three-on-three portion. - While Lieuwen and Ullmark were my top goalies, I really liked what I saw from Johansson in terms of athleticism and simple positioning. He seals off the bottom of the net and can really move. Playing deep works if you can track the puck well, and he seems to have that gift. Cal Petersen did a very nice job this week as well, especially when holding his ground when the pressure builds at the edge of his crease. - I have liked Dan Catenacci for quite some time. His speed and shooting are there, and I thought he played really well on line with Grigorenko and Fasching on Tuesday. Long term, I'm still trying to understand where he fits at the NHL level. Year two in Rochester will be big for him. He needs to dial in his consistency and push himself to a better progression to maintain his spot in a talented group of forwards. - If you didn't realize this by now, Compher is prickly with no quit. He did nothing to soften his NHL projection this week, as he takes away space and challenges the opposition each time he sets foot on the ice. - Lastly, Mr. Samson Reinhart. Everything he does is smooth and crisp. His passes are clean, and he makes it look easy. Those looking for a high-flying, superstar highlight reel player may want to find another player's jersey to buy, but patience in development is going to pay off with this kid once he's fully acclimated to the speed and physicality of the pro game. I still don't know what to do with him next season, but I'm eager to see him when paired with NHL caliber wingers in his first training camp. Kris: where was connor hurley ? To my mind Fasching demonstrated all the tools needed to be the power forward he's projected to be. The kid suprised me with his aggressive power, puck control, and soft hands. I think his stock rose significantly by the end of this camp. Kris: How does Baptiste's projection with Tropp's after his post-draft season? Seems like the latter's offensive projection was always a big guessing game, but that his speed/strength/aggression were always going to get him a contract and shot in the NHL. Baptiste has that same intangible feel, for me at least. I'm still a little confused by Tropp and I have to admit wishing he'd been kept a while longer. Seems like he found a role with Columbus and that, with regular playing time, he'll show value beyond that of a fourth-liner.